Recently Sara Ali Khan had faces alot of problems regarding the clash of Simmba and Kedarnath. Which got resolved in out of court settlement. She posted some pictures from the sets with actors and directors. In Kedarnath, Sara plays the role of a rich tourist while Sushant Singh Rajput is playing the role of a pithhoo. Shot extensively in Uttarakhand, it’s based on the infamous Uttarakhand floods. According to reports Shushant has wrapped up his part of shoot and Sara is set to complete her’s very soon. Sara Ali Khan’s picture along with Sushant and rest of the crew went online, in which the actor cut a huge chocolate cake in the celebrations. What comes as a really exciting experience, Sara is not just shooting for Kedarnath but for Simmba as well. During a break, Sara went shopping with her mother to the famous Laad Bazaar in Hyderabad. In this outing, Sara Ali Khan‘s picture with Amrita choosing bangals and headpieces went viral. The mother-daughter duo even posed with some local shopkeepers there. Apart from posing that, Sara also posed with some of her Hyderabadi fans and smiled happily with them. This is one such picture. Well, these pictures look cute an amazing. What really caused her problem was one video in past. In which she ignored a old lady who was waiting outside for her in Mumbai cafe. 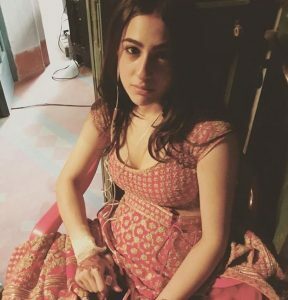 And here comes another trouble, she posted this picture on the occasion of Eid from the sets of Kedarnath. In Picture, people just didn’t notice the bandage on her arm. Infact not many paid attention to that, the thing that people noticed most was her low cut blouse. She wished ‘Assalamualaykum Eid‘ but her dress invited a lot of negative comments from the people. It’s worth noting that this wasn’t even Sara’s official Instagram post!. However she has received alot of bad comments due to this which is really shameful. There are always some negative people around us, when you go online there is alot more. So never let these things effect you. We can not wait for Sara’s both upcoming film.